Did you know that just by installing a new toilet you can save money on your water bill? Older toilets tend to use more water, costing you more on your water bill. A simple repair or a new replacement is beneficial for your bathroom and your wallet. 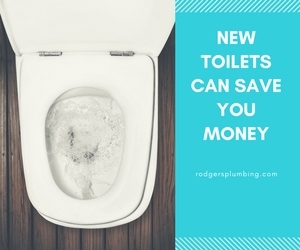 Having a new toilet installed can add value to your bathroom and save you money because many new toilets are environmentally-friendly to conserve water. There are different types of flushes for different toilets that are installed. These different types of flushes vary in the amount of water used for flush. The Standard Flush uses 1.6 gallons of water per flush, the Dual Flush uses between 1.1 and 1.6 gallons per flush, and the Power Flush uses about 1.0 gallons per flush. Rodger’s Plumbing can help you with all of your toilet requirements in the surrounding areas of north Dallas, Texas. When you call our plumbing company for toilet repair services we will send a licensed technician to your Dallas, Texas home to inspect your toilets. Rodger’s Plumbing will diligently work to locate the source of the toilet issue. Once the root of the problem is identified, it is our goal to complete the repairs or installations quickly and efficiently. In helping to achieve this, our technicians stock many standard commode parts on their trucks.